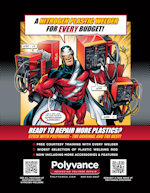 In 2007, Polyvance created a new ad campaign to promote our Bumper and Cladding Coat line of products. The response was overwhelming. We continued to use Sticky-Man to promote many of our products in most of the trade publications. In case you missed it, here is our latest advertisement.